An inaugural member of the Chicago Black Hawks in 1926, Mickey MacKay had previously dazzled fans along the west coast, where he led the PCHA in scoring during his rookie campaign in 1914-15 – scoring 10 more goals than famous teammate Cyclone Taylor. The “Wee Scot” would also appear for Boston and the fabled Pittsburgh Pirates, with Lester Patrick once stating, "He was perhaps the greatest centre we ever had on the coast”. 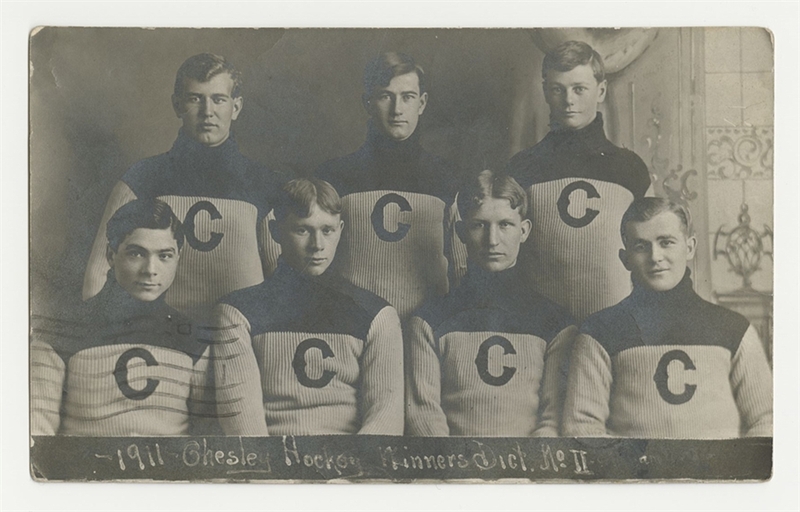 We have an especially rare real photo postcard of the Chesley Hockey seniors from 1911 – District No II winners – featuring Mickey MacKay. At the standard 3 ½” x 5 ½”, the full squad including rover are pictured, with Mickey appearing at top right. With a divided postal reverse with handwritten text, there is a 1 cent stamp affixed, with an April 10th 1911 postmark. There are a few large creases and circular indentations, along with corner, surface and edge wear. Toning has also taken place over the verso, with heavy silvering to the image. This is the only example of this rare postcard that we have ever handled or seen. MacKay would be enshrined within the Hall of Fame in 1952.